The Responsible Gold Ecosystem, developed by Emergent Technology Holdings LP ("EmTech"), is the world's first gold supply chain ecosystem to receive Shariah-compliance certification. The blockchain-based platform comprises the Responsible Gold Supply Chain Application ("RG SCA"), which automates the tracking of responsibly sourced gold from mine, to refinery, to vault, and G-Coin tokens, which are digital certificates of title to responsibly sourced gold. The Shariah Supervisory Board of Amanie Advisors found that the RG SCA and G-Coin tokens exceed Shariah requirements on transparency and ethical trading. "The usage of blockchain in delivering the solution to create a transparent and ethical ecosystem is timely. Shariah principles demand transparency, traceability, and accountability," said Datuk Dr. Mohd Daud Bakar, Amanie Advisors founder. "The Shariah-compliant endorsement of the RG SCA and the issuance of G-Coin tokens will give confidence to Islamic investors and gold players to participate in this initiative and play bigger roles to create a more ethical and conflict-free ecosystem." "This Shariah endorsement opens the Islamic community to an unprecedented asset class. For the first time, over one billion Muslims can buy Shariah compliant responsibly sourced gold with provenance assured," said Matthew Keen, EmTech's Managing Director, Responsible Gold Trading DMCC. "Gold miners and refiners who use the RG SCA demonstrate their commitment to ethical sourcing and traceability. This Shariah accreditation will reward the gold industry with new sources of demand, as well as new funding opportunities from the Islamic community." EmTech's RG SCA is in operation in multiple gold corridors. 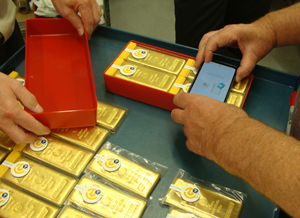 Using a mobile application, supply chain participants scan tamper-proof cryptographic seals attached to gold to create immutable provenance and custody records. Data is recorded instantly on EmTech's blockchain, providing irrefutable assurance that gold has been produced ethically and in adherence with the highest industry standards. Once a kilobar is produced, EmTech's imaging technology uses artificial intelligence to validate a bar's authenticity. A portion of the gold tracked by the RG SCA is digitized into secure G-Coin tokens, which can be bought as an investment, moved easily to transfer wealth or used to make payments. G-Coin tokens are redeemable for their underlying, responsibly sourced physical gold. "It is a known fact that there are a lot of uncertainties about the origin of gold entering the market. There are reports associating this problem with illegal trade and money laundering activities, which are harmful to society. The Responsible Gold Ecosystem can help solve this problem by tracking and safely storing all data and information about the gold supply chain onto the blockchain. From the Shariah perspective, the technology also helps ensure that upon issuance of G-Coin tokens, each token is backed by allocated responsibly sourced gold from the ecosystem," added Dr. Daud. "EmTech's endorsement further positions the region as an important hub for responsibly and ethically sourced gold. We are committed to creating a valuable trading environment across the region and EmTech's Sharia-compliant certification will certainly have a meaningful impact," said Ahmed Bin Sulayem, Executive Chairman, Dubai Multi Commodities Center ("DMCC"). "It opens up a host of new investors within the Islamic finance community and enhances investor trust. It is an important milestone for EmTech and we are proud to have the company as part of the DMCC community." EmTech's RG SCA is available for licensing and G-Coin tokens will be available for purchase later this year. "G-Coin tokens combine the best attributes of gold as a diversifier, risk management tool and long-term preserver of wealth with state-of-the-art technology built for financial markets. We welcome the opportunity to bring G-Coin tokens to the Islamic finance community with confidence that any G-Coin token transaction will be a decentralized and instantaneous investment in physical Shariah-compliant gold," added Keen.